WOODS HOLE, Massachusetts, May 31, 2011 (ENS) – An assessment of coastal change over the past 150 years has found 68 percent of beaches along the New England and Mid-Atlantic coasts are eroding, finds a new report from the U.S. Geological Survey. 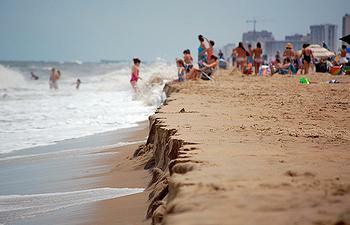 In the most extreme case, erosion exceeded 60 feet per year. Scientists studied more than 650 miles of the New England and Mid-Atlantic coasts and found the average rate of coastal change was negative 1.6 feet per year. Beaches change in response to a variety of factors, including changes in the amount of available sand, storms, sea-level rise and human activities. How much a beach is eroding in any given location is due to some combination of these factors, which vary from place to place. Over the past 25 to 30 years there has been a small reduction in the percentage of beaches eroding, from 68 percent down to 60 percent, the scientists observed, possibly as a result of beach restoration activities such as the addition of sand. The Mid-Atlantic coast – from Long Island, New York to the Virginia-North Carolina border – is eroding at higher average rates than the New England coast. The researchers explain the difference by saying the sandy areas of the Mid-Atlantic coast are more vulnerable to erosion than stretches with more rocky coasts such as New England. Although coastal change is variable, the majority of the coast is eroding throughout both regions, indicating erosion hazards are widespread, they found. “There is increasing need for this kind of comprehensive assessment in all coastal environments to guide managed response to sea-level rise,” said Dr. Cheryl Hapke of the USGS, lead author of the new report. “It is very difficult to predict what may happen in the future without a solid understanding of what has happened in the past,” Hapke said. In the course of this study, the researchers used historical data sources such as maps and aerial photographs, as well as modern data like light detection and ranging, or LIDAR, instruments to measure shoreline change at more than 21,000 locations. This analysis of past and present trends of shoreline movement is designed to allow for future repeatable analyses of shoreline movement, coastal erosion, and land loss. The results of the study provide a baseline for coastal change information that can be used to inform a wide variety of coastal management decisions, Hapke said.